Today is special day to me where I had already signed up my very own personal official Gmail account, Facebook and Dropbox for the my course purpose. I tried to follow all the instructions that given by my lecturer step by step and it works! All this while my learning style was "Monkey see, Monkey do"(request the teacher for demonstration and do the same) and this time was a bit different where I will not see how teacher do it but I have to do it by myself. I believe it's time for me to equip myself with the knowledge of IT. In future, the usage of paper surely will become less and paperless, so it's time for me to know how to use my Gmail well and catch up the footstep of this world. Computer is a very powerful tool where it enables us to finish our task in a very short moment and with least energy been used. To me, computer is a great tutor in helping me personally to find important information and giving me chance to exposition to the world. I can meet different people from different countries and listen to their very own story that will brighten up my life. As the same time, computer has change my lifestyle where now I can do a lot of art designing by using applications in computer which gives a better effect and results of my painting and there are varieties of entertainment where I can get through when I switch on my computer and connect to internet. Computer is not the most important things in this world nor it is not least important too. We should maintain our ethics in using our computer in a good and wisely way. Learning management system (LMS) is a software application or Web-based technology used to plan, implement, and assess a specific learning process. LMS is a platform for lecturer, teacher or instructor to deliver the messages, syllabus of learning programme, conduct learning activities and content to the learners through online. Free Software of LMS are iFolio, Moodle, Blackboard, Latitude learning, Dokeos, Schoology. Course Management System (CMS) is a web-based course environment that allows instructors and students to deliver course materials, submit assignments and tests, view grades, create learning activities, and share documents, calendars, and sites. CMS has been widely used in institutions, organization, faculties in universities. CMS is also a software tool for course interactions through online and it enables the lecturers or instructor to have discussion on their tasks or assignment even announcements with the students without meet up with one another. Free Software of CMS are Wordpress, Joomla, Drupal, Silverstripe, FrogCMS. I'm so happy to see the birth of unity among us where my course mate and I all very hard working in searching information to complete the assignment. We're still in progress in completing our assignment. I hope we all will learn something through this assignment. CASPER~~ CASPER is an acronym for Contrast, Alignment, Simplicity, Proximity, Emphasis and Repetition. The CASPER principle is a very good guideline for us to create a useful and informative slideshow for imparting knowledge. Through CASPER principle, we get to know how we can prepare, arrange and beautify our slide. Today my beloved lecturer, Mdm Siti Fatimah shows us how to create survey forms through Google Drive. It was fun and knowledgeable where we can save so much of time because the system will help us to wok on the responses of the respondent and get accurate results. Mdm Siti Fatimah told us that we need to be more initiative in learning computer skills and this reminds me of the previous reflection I've wrote...(No more "Monkey see, Monkey do" principle in university). Hence, she also shows us how usually she learns from the internet. I need to work hard for my assignments last week because there will be one week holidays for next week, I don't want to spend my holidays by doing assignments at home. I met up with my course mate to discuss the presentation for Assignment 3. It's quite challenging in preparing slides through Google Presentation. After rounds of discussion with my course mates, we started to start exploring Google Presentation. It's actually quite similar to Microsoft Power Point just that the features is different from one another. Our slides for assignment 3 is still in progress but I believe we can finish it before Friday and show to our beloved tutor- Mdm Siti Fatimah for improving our works. It's good to work together! Our survey form had been finalized and upload to Weebly Forum! Happy to see so many of our friends from different courses had participated in answering the survey form. On the other hand, I would like to thank Dr Fariza for uploaded the video in Weebly Forum. It really helps my team in creating our survey form. Do click the link below to check out our survey form. It's been awhile I updating my Weebly due to I fell sick for almost a month. After my group done with the mini research, we started to analyze data that we get from the respondents.With the help from Mr Google (Google Drive), all the statistic were shown and it really saves up our time in calculate the percentage and so on. We write in essay form to present what we got after we analyzed all the data from our mini research. Now I'm familiar with Google Docs and it's really a good tool to help us in getting data and analyzing data. First time to click on the Microsoft Publisher button in my entire life! My teammates and I were so desperate to work this week assignment out due to huge curiosity in all of us. We never use Microsoft Publisher and we're going to rock things out! We chosen some pictures where it looks interesting and helpful in the process of making a brochure which share the contains the Very Important Information (VII). We almost click on all the buttons in Microsoft Publisher to look for the best for completing our task. We work really hard and I feel so proud of my whole team because we share our thoughts and ideas just to present our best in this particular assignment. In this assignment is very interesting where we really work hard on it and we found out that making a movie is not that hard. We sat down and started to discuss what to put in the video. After few rounds of brainstorming, ideas were jot down and we started to build our very own short video. It's not that hard to make a video nowadays and my teammates and I work it out step by step and we used 5 hours to finish our task. Please click the link below to check out our video about ICT and Listening Skills in Education. Enjoy! There are so many things to learn in GE1155! Microsoft Excel really amaze me when Dr Siti Fatimah show me step by step in how to utilize it. 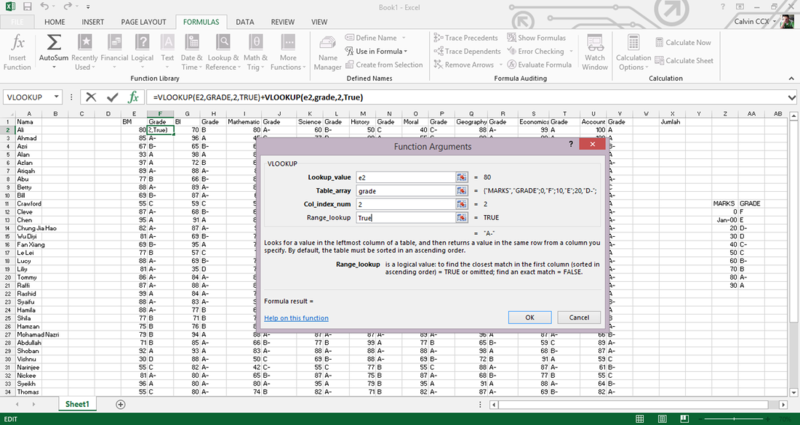 Now I know what is the function of VLOOKUP, STDEV, AVERAGE, COUNTIF and etc. I really learn a lot today and all the knowledge are so important for now and future! Learning how to use Microsoft is quite challenging but with the helps of lecturer and my schoolmates, everything is in control! By the grace of God I can finished all my assignments on time. I wanna take this opportunity to thank my tutor, Mdm Siti Fatimah on her caring and willingness guidance. Basides, I would like to thank my teammates, Khairul Amar abd Arif Yaakob. They were so kind in helping me to make things success as well as finishing our group assignments with an excellence team spirit. I was not well for the past 4 weeks but yet they understand me and assisting me in completing my assignments. Thank you brothers! I learn a lot in this course and I take this subject with a serious manner where all the soft skills that I've learned will be useful for my future of being a good teacher. Now, it's time to pause for awhile at Weebly and focusing on my Final exam in less than 2 weeks time.